Excursion train in coastal CaliforniaSeeing a massive steam locomotive chugging into a California station was a commonplace thing back in May, 1941; that was when locomotive #4449 was completed by the Lima Locomotive Works of Lima, Ohio, for Southern Pacific, and placed into service. The #4449 is now one of the only surviving examples of the streamlined GS-4 class of locomotive, a 4-8-4 Northern type of steam engine. 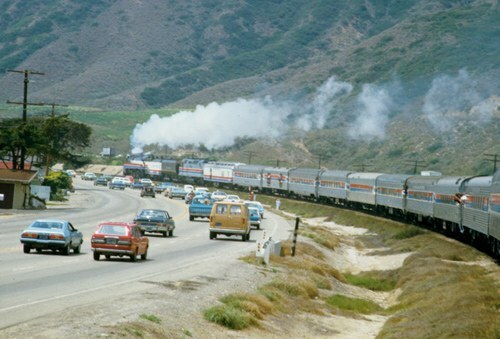 It wore the famous red and orange "Daylight" livery for the Southern Pacific Railroad (SP) during its revenue service, which concluded in 1958, at the very end of the era of steam rail. 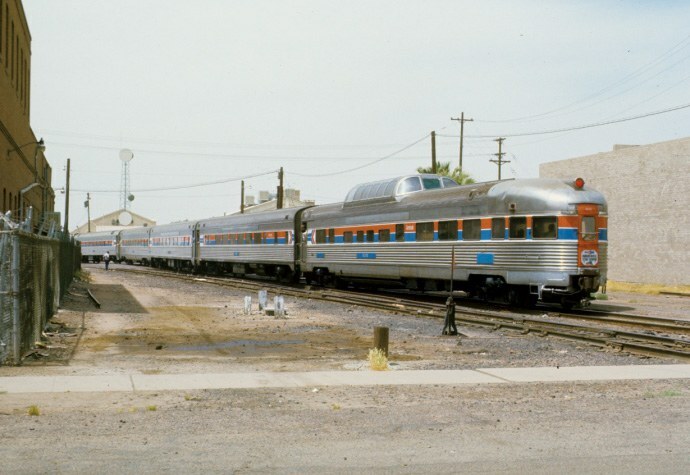 Phoenix, Ariz.In 1958 , #4449 was donated by SP to the city of Portland who then put it on static display in Oaks Park, where it remained until 1974. It was restored to operation for use on the second American Freedom Train, which toured the 48 contiguous United States for the American Bicentennial celebrations. Directly after that, and while still wearing its Freedom Train livery, #4449 pulled a one-time Amtrak Steam Excursion train across country in April 1977, on its way back home to Portland, Ore., as you can see above. It was pulling dome observation car # 9310, seen in this picture from a few days before as it pulls into Phoenix, Ariz.
"Engine AFT 4449, a mighty, steam-driven locomotive, will power passengers aboard the Freedom Train across America for, perhaps, the last time. "Amtrak wishes you a pleasant, truly memorable journey on this very special occasion." Stops indicated are Oakland, Martinez, Davis, Orland, Redding and Dunsmuir. Fortunately, #4449 still lives in Portland, Ore., because of its many fans, and continues to shepherd special excursions. While the age of steam may be over, at least this piece of history is still chugging into the future.